Over the holiday weekend, we took back roads through a lot of small towns in rural areas with stagnant economies. Now granted, money is tight in these parts, but it seems unnecessarily frugal, not to mention unhygenic, to lay out your loved ones in a storage unit, next to the old baby toys, excercise equipment, and furniture you’ll never get around to refinishing. Maybe they freeze dry them first. Or 'pickle' them? 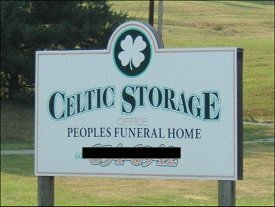 Those crazy Irish!